I was looking through the National Trust handbook one day and I came across a picture of Lyveden New Bield in Northamptonshire. I was completely taken aback, not by its lack of roof, but because I knew instantly that it was the work of Thomas Tresham. This was shocking, because me being able to tell you who designed a building just by looking at it is akin to Miley Cyrus being able to recite The Ancient Mariner or tell you about the finer nuances in the works of Proust. I know NOTHING about architecture. Thomas's son, Francis Tresham, died in the Tower of London having been involved in the Gunpowder Plot. It's claimed that Francis wrote the famous letter that gave the game away - the letter was written anonymously warning a family member to stay out of Parliament but it made its way into official hands, which led to Guy Fawkes being caught skulking about with unexplained bits of explosive. Francis did indeed have two brothers-in-law that would have been blown to bits had the plot succeeded but he always denied writing the letter. Francis died of a gruesome-sounding urine-related illness while awaiting trial. They cut off his head anyway, stuck it on a spike like the other plotters, and threw his body down a hole. There are three buildings in Northamptonshire that Thomas Tresham constructed and all feature symbols of his Catholic faith. Triangular Lodge in Rushton is a miniature show-stopper - we used to walk there on school trips, somehow without getting killed - and I urge you to see it. The Market House in Rothwell has long ceased being home to my Topsy and Tim books but still fascinating. And then there's Lyveden. I decided to take some Northamptonshire Catholics along to Lyveden, namely my mother and my sister. If you've ever watched The Royle Family then you'll have some idea of what this was like, as I am basically related to Denise and Barbara Royle. But they'll be really upset with me for saying that, so I better not elaborate on the 578 examples I have to hand of them behaving thus. I regretted my choice within 30 seconds of arriving. "There it is!" I said happily on seeing the roofless Lyveden in all its isolated splendour, to which Denise Royle replied "How do you know that's it?". So I pushed her in the moat. The tearoom at Lyveden is relatively new but it is quite possibly the nicest National Trust tearoom in existence. Cosy doesn't even begin to cover it - the log burner was a sight for cold limbs, and the waitress service was really efficient and friendly. There was a choice of plain or fruit scone, the jam tasted home-made and was delicious, and the scones were really tasty, as was the tea. Well done, Lyveden. Lyveden itself scores top marks for a) being fascinating b) having Robert, the most helpful man ever, manning the visitor centre and c) providing a free audio guide. My love for audio guides at National Trust properties knows no bounds (see also Petworth and Osterley House) and I appreciated it today more than ever. Work started on Lyveden New Bield in 1594. As well as being a dead-ringer for Edmund Blackadder, Thomas Tresham was a generous host (too generous it would seem; he died heavily in debt, although having to pay fines left, right and centre to get his treason-magnet son out of bother didn't help) and the new building was to be a garden lodge for entertaining. He died in 1605 and work on New Bield ceased, although his wife, Muriel Throckmorton, continued to use the property (it's rumoured for worship). During the Civil War, Lyveden was seen as a Papist abhorrence and was pillaged for building materials. However, somehow it remained pretty much in tact and has miraculously remained so for over 400 years. So as you can probably gather, I loved Lyveden and would highly recommend it and its wonderful tearoom. Love this post, especially your Royale family references!! Your Mum & Sister don't read this, right? If so I doubt they'll read it (or speak to me) again! 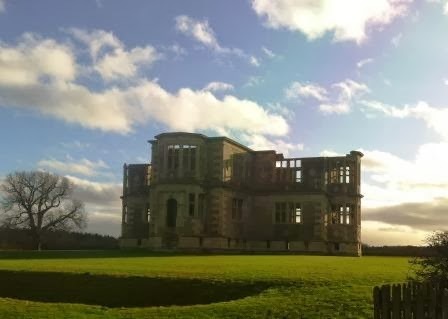 Fascinating place to visit and difficult to find a better tea room than Lyveden.. a return visit is a must! !